Elizabeth says she lost her home of 20 years because of about $2,000 in unpaid property taxes. She says she tried to fight the deed take over in court, but ultimately lost an emergency stay, leading to her eviction and loss of property. April 2017: Elizabeth is suddenly homeless. After working sleepless through the night, Elizabeth rummages through her belongings the following Saturday morning. She says she lost her home of 20 years because of about $2,000 in unpaid property taxes. 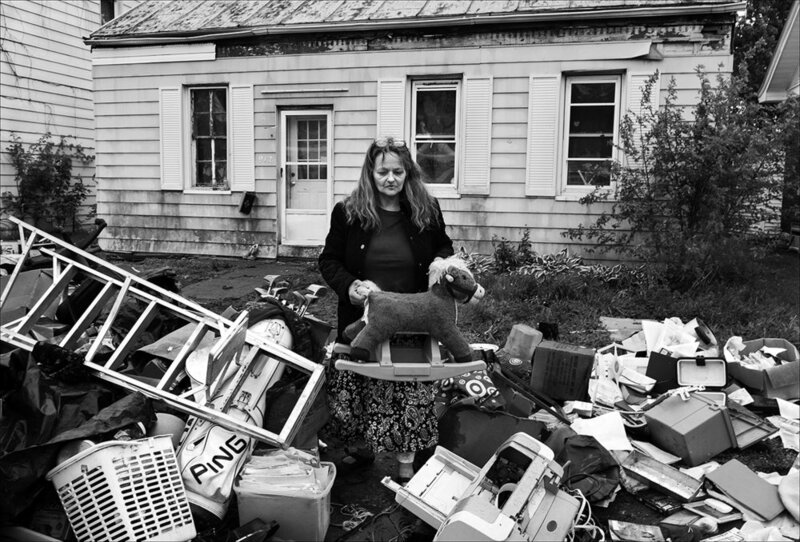 She says she tried to fight the takeover in the courts, but when she lost, movers for the new owners arrived with sheriff’s deputies and set everything she owned out in the rain. She says trying to save her home from being taken out from underneath her, consumed her life night and day since July 24, 2016, when she first saw the legal notice in the newspaper. Assuming her mortgage lender had paid the 2012 property taxes, Elizabeth says she was on a sabbatical from work to take care of her 84 year-old-mother who had a broken back when she discovered in a newspaper her name and that they were filing to take her property. April 2017: Family photographs and cherished letters lay waste in the heavy rains that persisted Saturday and Sunday as Elizabeth and volunteers struggled to load and transport her things to rental storage which was paid for by the generosity of volunteers. 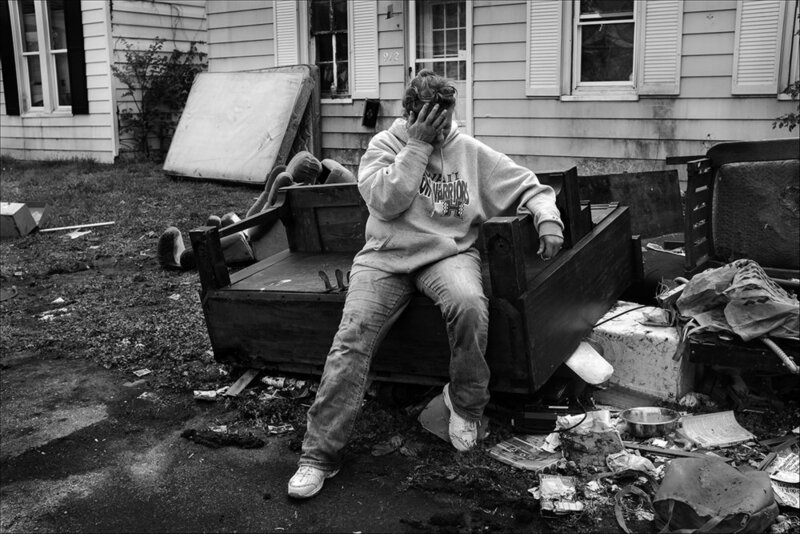 April 2017: Elizabeth breaks down in tears as one of several volunteers with trucks arrive to help her after learning of her plight on social media. “I was cold. I was really tired. It was 1 in the morning. My son had come over for a little while and had put some very heavy things on the U-Haul. How can you be organized when they take everything out of your house, when you're not there when they do it? And then nothing is packed in boxes except for the few I had packed? They're just thrown in a pile. My clothes are all wet. My clean work clothes of seven white shirts and about six pairs of white pants and three aprons are all soaked. Loading that U-Haul, I'm 55. I really don’t have aches and pains but I was pretty damn tired lifting all those heavy boxes. I was there all night long,” Elizabeth said. May 2017: Overcome with emotion, Elizabeth rests on her rain-soaked, antique piano, now a total loss. She said at age 36 she wanted to learn how to play piano and searched until she found one she could afford and took piano lessons. "I was saying goodbye to my old friend," she said. May 2017: The marks Elizabeth placed on her piano keys years ago when she began taking lessons are still visible after her treasured "friend" was left to ruin in the rain. May 2017: Three days after being evicted from her home of 20 years, Berrian Elementary School third-grade students deliver May Day flowers to Elizabeth, as they have for years throughout the neighborhood. She takes a short break from gathering her belongings to bask in the memory of receiving this special blessing from the children all these years knowing this will be the last time.